Which antivirus maker just got caught cheating on a performance test? Is your Internet service provider limiting your 'unlimited' Internet service? And what kind of pizza should you order if you've been kidnapped? Get answers to these burning questions, and the scoop on the latest tech news, in this edition of the Geekly Update. It's guaranteed to make you 146% smarter. Read, think and comment! What should you do if you're being held hostage in your home? 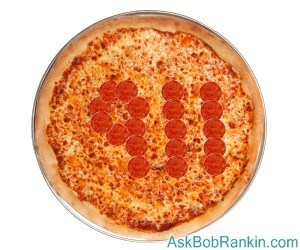 Order pizza! Cheryl Treadway did exactly that, and requested a side order of 9-1-1, which alerted a Pizza Hut employee to her plight. Treadway's boyfriend had seized her phone, but she convinced him to return it so she could order pizza. She then used the Pizza Hut app to summon help without raising the suspicion of her captor. Apple sold 22% fewer iPads in the first quarter of 2015 than it did in the same period of last year. That’s the fifth straight quarter of declines. Have we reached peak tablet? China’s largest security software vendor has lost all of its certifications after being caught cheating on tests. Independent antivirus testing labs AV-Comparatives, AV-TEST, and Virus Bulletin agree that Qihoo 360 disabled its own antivirus engine and enabled the Bitdefender engine in samples sent for testing, the opposite of the default configuration required in test samples. "Your mother is calling..." Six baby ducks were trapped in a storm drain, and one firefighter in Slidell, Lousiana had just the right technology to save them. Cody Knecht used his cell phone to play a quack-quack ringtone, which lured the unsuspecting ducklings to safety. In India, Kachir Gaaw, daughter of Gura Dand, applied for and received an admission card to the country's Polytechnic examination. That would be fine except her name means “brown cow” and that’s what her picture on the admission card shows. (Her father is “red bull.”) Authorities say their image-recognition software can’t distinguish between a human and bovine face. The Grooveshark streaming music service has shut down as part of a settlement of copyright infringement claims lodged by the RIAA. Grooveshark allowed members to upload copies of songs they purchased legally and share these “backup copies” with others. Ducks, cows, sharks, and now... a cobra! The U. S. Dept. of Energy not only 3D-printed the frame and chassis of a classic Shelby Cobra car, it made the vehicle all-electric. “Unlimited” still isn’t really unlimited even when you’re paying over $300 a month for “unlimited,” says Verizon. The company warned a residential FiOS subscriber that his service would be terminated if he didn’t stop averaging over 7 terabytes of data per month. The customer blames SETI@Home and other distributed-computing projects for his enormous data traffic. "Donate to our cause, or we'll sue you." A billion-dollar lawsuit has been filed against Apple, Google, Samsung, and Microsoft by CADD – the Coalition Against Distracted Driving. CADD wants the money spent on a nationwide public education program to discourage distracted driving. Most recent comments on "Geekly Update - 06 May 2015"
If CADD wins their lawsuit, will they text me messages educating me know how to keep from being distracted? I am so glad to have found out that this is the only source of distraction for drivers. Hmmmm? I wonder if they could teach Spot not to jump back and forth over the seat and not to bark at blue Kias? EDITOR'S NOTE: One problem is that the human brain is not particularly well-suited for multi-tasking. Computers do that well, but humans not so much. Add to that the fact that the brain is not fully developed until the age of 25 or so. Younger people (boys especially) have not developed the ability to realistically gauge risk. To me it is every drivers responsibility to operate a vehicle safely. If you're going to wear a smart watch while driving and you know it's a distraction, take it off before and put it back on after driving. A small inconvenience compared to loss of life or serious injury.